Good grief, have we already passed the halfway mark for the Spring 2015 season? I guess time flies when you’re going through major life transitions…or something like that. Anyways, I’m back, which means it’s time for one gigantic post covering the last two weeks I’ve been silent—but before that, how about a little announcement? 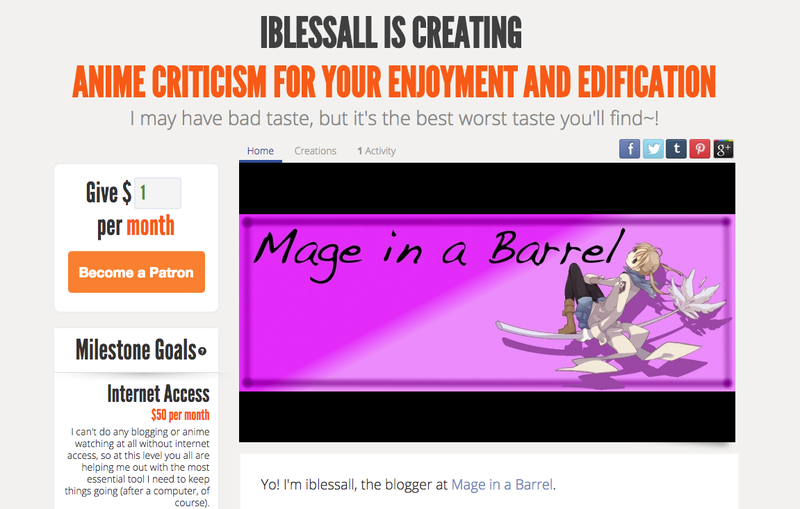 Mage in a Barrel is now on Patreon! This is something that’s been in the works for a while now, but I didn’t really feel good about asking for pledges while I was on hiatus. Now that I’m back and have a more established schedule, I’m excited to announce that you can now help support my compulsive anime blogging on Patreon. I’ve come up with a few fun rewards that I think are sustainable over a long period of time, should you decide to join on as a patron. Hopefully, this new step will also enable me to keep coming up with new types of content (I have a few ideas for audio-visual content kicking around in my head right now) by giving me a little more financial flexibility. In the interest of full disclosure, I’m not in dire financial straits or anything—I’m not launching this to avoid be able to pay rent or anything like that—but I am currently in something of a transitionary period in my employment and things are going to be a bit tight for me in the coming months. I’ll make it either way, but if you feel like helping out it would certainly help me cut down on overtime hours so I can spend more time working on the blog. Anyways, I’m super excited about this and whether or not you are able to help out as a patron, I’m really grateful for your support! Anyways, enough of that—let’s talk about what’s been going on in the anime world in the last few weeks while I’ve been away. Due to the massive number of episodes that are going to be covered, I’m organizing this by day of the week, so hopefully that keeps things readable. Yamada and co. have turned into one of my favorite shows of the season thanks to the excellent work of the Michiko Yokote writing team. By way of a quick word collage of the words that come to mind thinking about both the source manga and the anime adaptation—energetic, quickly paced, fun, rabidly likable come to mind—I think it’s appropriate to say that the anime has taken pretty much all of the manga’s strengths and expanded upon them. The Yamada x Urara moments have been total knockouts, even more so than they were in the manga; the voice acting has done an incredible job selling the body switching gimmick, beside instilling a whole lot of verve into the show despite minimal animation; and the soundtrack is one of the season’s best (probably second only to BBB) with it’s blend of classical pieces and peppy electronic hooks. 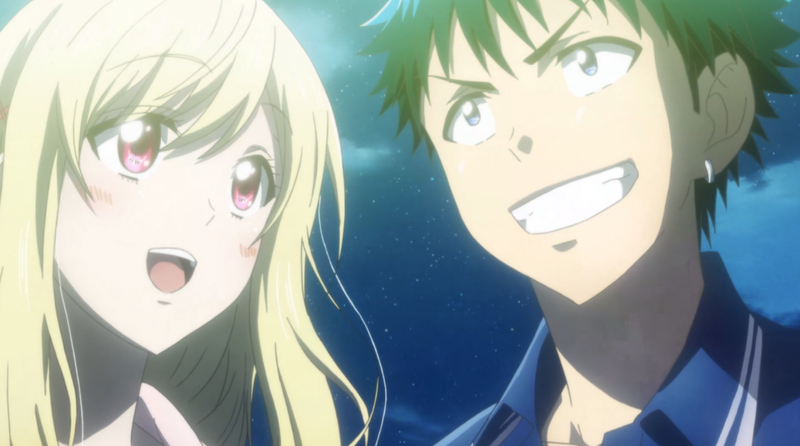 I’m totally happy with Yamada-kun right now, more so than with many of my shows this season. Show by Rock!‘s coming out of a genuinely hilarious episode thanks SHINGANCRIMSONZ apparently bottomless capacity for being incredible doofuses, episodes six and seven also stood out of SBR!‘s best episodes visually. Between the ethereal lighting and colors of the beach (and oh my gosh Moa’s revelation scene was absolutely gorgeous) and the creatively wacky art design of the yokai town, it seems SBR!‘s got a genuinely talented art design team who’ve been kind of limited by the neon-heavy borders of MIDI City. As far as the show’s content goes, the main charm here continues to be the oversized personalities of the characters—even though Plasmagica is a little more grounded than SHINGANCRIMSONZ, there are still some great absurdities in the girls’ group, like Moa’s casually handled revelation as an alien. As per the norm, there’s not much to report here. Kinmoza keeps on clicking along with the same old formula and the same batch of adorable, silly, and adorably silly characters. Karen continues to be the show’s highlight, but Shino has actually been getting me to crack up a lot with some of her non-featured jokes. Kinmoza‘s hit:miss ratio with its jokes is really something astounding and it makes the show a joy to watch each and every week. Well, there were jawdropping hairflips in Eupho‘s sixth episode, but KyoAni, director Tatsuya Ishihara, and the apparently irrelevant Jukki Hanada (script for all 7 episodes so far, as well as series composition—seriously, why is no one talking about this guy at all?) are pretty much unfailing in delivering solid episodes that are sneakily excellent. Attention to detail really seems to be Eupho‘s calling card halfway through the show, whether that be in the little nuances of what the characters say, how they move, how the camera shoots different moments. It’s all meticulously calculated, but in a way that’s most invisible (as seems to be Hanada’s style) except in the big moments. For a show about a high school band, Sound! Euphonium‘s surprisingly quiet in the way it goes about being good. I don’t think I ever made an official announcement that I’d dropped Mikagura, so here it is. One episode without a cool battle was all it took for me to tire of the show; sadly, Juri Kimura’s excellent voice work wasn’t enough on its own. I’m nowhere near as far behind on posts for this show as I feel. Episode six’s post is scheduled to go up on Wednesday, with episode seven following a few days after—and then I’ll be back on schedule. I’m still enjoying the show, although it’s definitely dropped a few spots in my favorites standings due to execution that doesn’t do much to elevate the material. 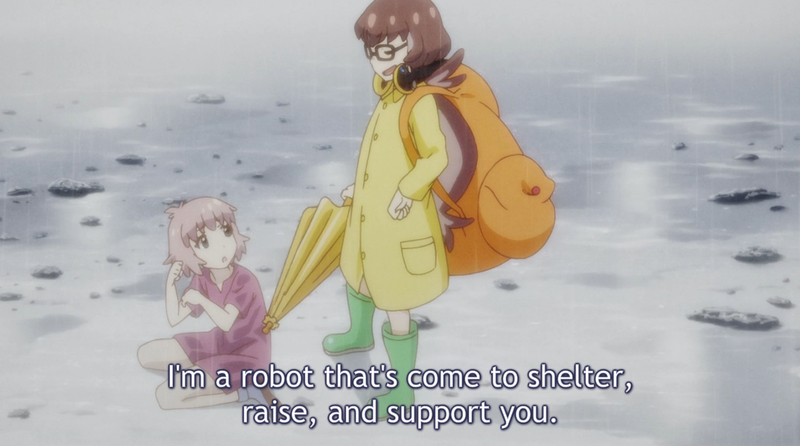 Punchline sadly hasn’t been able to live up to the quality of its fourth episode, as the plot movements of the latest episodes really seem to be relying on character investment that I just don’t have. I know I’ve talked before about how sometimes cute character designs are enough to endear a character to me, but Punchline‘s undirected randomness and persisting forays into juvenile humor are creating enough barriers that the show’s generally weak writing on a character level is becoming an impediment. Episode 6’s “twists” felt pretty uninspired to me, as plot machinations seemingly solely for the purpose of being “surprising” really didn’t do anything for me at all. Punchline‘s pretty close to getting dropped at this point, but we’ll see what the reset does for the show this time. If episode 7 lacks a punch in the same way 6 did, I’ll have another day to keep watching Rose of Versailles. I’m two episodes behind right now, but I caught up with Assassination Classroom a couple of weeks back and I’m really glad I did so. I thought I didn’t need another comfortable slice-of-life type show in my schedule this season, but Assassination Classroom apparently makes for a really great marathon watch and, although I’m still wishing for more expansion with the actual students and desperately waiting for the next Irina episode, it’s just a totally nice watch that I’m happy I’ll be able to go back to in a few weeks. I said this on Twitter, but I’ll say it again here: Yuki-chan has become what I imagine was once a fan ficiton someone set out to write about Nagato, before remembering halfway through that they liked Haruhi the best. Haruhi has completely taken over the show by this point and all the cute bashfulness that made the pre-Haruhi episodes charming has become more of an annoyance (or at least a drag) at this point. Things aren’t entirely lost, but there’s not much juice left in the Nagato x Kyon romantic subplot anymore with Haruhi taking up the bulk of the show’s engagement fuel. Like Kinmoza, Nisekoi: is one of those cases where you get what you expect each week, which is a good thing. Unfortunately, though, the production this season has been far less consistent than with the first season—characters in recent episodes have been off-model and the signature SHAFT flair from the first season has become much more like an obligatory garnish than a main, important ingredient like it was before. Which…is kind of sad. The episodic stories are still funny and entertaining, but the content itself is really pulling the rest of the show along (as weird as that is to say about a show like Nisekoi:). Hopefully SHAFT gets things figured out. I assure, the delay in posts on BBB has nothing to do with my feelings for the show. BBB is still my favorite show this season by a mile and seemingly does whatever it feels like doing effortlessly and entertainingly. I’m super excited to write-up episode 5, not only because it means I get to watch episode 5 again, but because BBB continues to be a rewarding as visual craft as it is as entertainment. After that, I have a variety of other stuff I want to work on (including catching up on BBB posts), so rest assured that more fun stuff is coming your way. Thanks for reading all the way to the end of this long post, and I’ll see you tomorrow for some shoujo romcom cuteness! Second I’ll do Patreon but it will be a week or two as I am on a budget too! I will do just compare my week 7 rankings as they went crazy this week! Punchline (Episodes 5 & 6) / 35TH After ep 1 just so confusing for me! BTW all caugt on the manga / do not drop this show you have no idea ! The Disappearance of Nagato Yuki-chan (Episodes 6 & 7) / 31ST I was tossing this around whether to move up I had other big changes first! Blood Blockade Battlefront (Episodes 5-7) / 17TH Each EP is really good but it just jumps all over the place for me Maybe too random with such a strong foundation But that’s just me! Food Wars: Shokugeki no Soma / The battles have begun very true to the manga which I am caught on too! 16 Triage X / Cant help it I like this / Where is MY HOTD 2 ?? Very glad to see Euphonium and Yamada-kun moving up in your rankings! I think they’re both really great shows (although Yamada is certainly a magnitude less impressive than Euphonium). You’re watching the English dubs for everything, too? Dang, you’re crazy! It was foreshadowed all along! We thought it was just a homage to the movie, but Nagato is actually going to just fade out and it’ll become another Haruhi story! SBR: It’s not like the core cast is bad at all, but as you said SHINGANCRIMSONZ is really the highlight of this anime. Euphonium: Yeah, the show is all about the school orchestra band drama and I’m really digging it so far. Of course, the latest episode seems to add teenage love drama into it too, I hope it won’t make things worse. I’m probably overreacting, for all I know there isn’t going to be that much drama after all and in either case they’ve done a great job so far that I’m still hopeful. In any case, I really hope for more of Tsukamoto the childhood friend – it’s kinda rare to see a childhood friend like him in anime, and he brought a new, different perspective compared to the other main characters that it’d be interesting to see his thoughts more. Punchline: I’m a sucker for this kind of twisty mystery story so I’m all in at this point (seriously though, we need more detective anime), but I can see all the flaws and see if people have problems with it. Like you said, I don’t think we’re fully invested in the characters yet for their actions to leave that much impact on us, but I guess that’s harder to do when their entire character, let alone their motivation, is set up to be a huge twist later. After all, one of the easiest way to relate to someone is to see them open up their feelings, and that’s pretty difficult when them keeping a secret is the whole plot point. There’s probably better comparison to this, but the thing coming to my mind right now is Steins;Gate. Despite the first half being ‘filler-y’, it does help us understand each character and why they’d struggle so hard doing what they do in the second half. Although to be honest, the resolution of the plot was rather underwhelming for me personally..let’s hope Punchline can bring it all together in a satisfying way, at least. Danmachi: Yeah, it really needs more Hestia and Bell. Aiz is actually not bad at all, but Lili and her arc is a disappointment for me. Like you said, there’s some really dumb stuff even with this kind of stuff and the harem fanservice is way more apparent now, but I think I’ll see this through until the end of the cour. AssClass: It’s still really fun, but I don’t have the same passion to watch it that I did before – part of it is probably it being less new and shiny, especially compared to the other airing show, as well as my personal circumstances though. It’s still pretty good whenever I get around to watch it, and this latest arc is a real good one too. Nagato Yuki: I’m actually not watching this, but from your comments, I guess this is what would actually happens when you give the ‘best’ side girl to become the main girl? I mean, you know how in most harems the main girl (that is obviously primed to win later) is usually the least popular, and the fans tend to gravitate to a certain side girl to be the best one? Of course, this really doesn’t work with Haruhi since Kyon and her has a very real chemistry together (across dimensions even, it seems) but we saw what happen when the side girl Yuki become the main girl. It turns out that often the major reason they become best girl is exactly because they’re not the main girl, and that when it happens, it become obvious that either their character isn’t really deep enough to be able to carry being the protagonist. Either that, or they’re force to give her more conflict/drama/flaws to compensate, which makes her not the best girl to fans anymore. re: your comments on Yuki-chan—I think you’ve nailed it exactly. Very often, my favorite character in a show is a side-character, but it’s very rare that I actually feel like I want a full show just about them. There’s also “main character syndrome,” where people don’t like the main character just because they’re the main character and are getting the bulk of the screentime (like Honoka from Love Live!). Same for AssClass. It’s not a show I’m ever fired up to watch (thus being two weeks behind again, after being five behind), but I always enjoy it when I do watch it. I have tons of confidence that Euphonium will handle the new teenage love drama well. There hasn’t been a misstep yet in that show, writing-wise. Well, this seems like a good time for a midseason reset. Here’s where I stand on everything. 1. Euphonium – beautiful visuals, great music, strong writing, just a winner all the way around. I really like all the main characters, and Tutti is my favorite ending of the season. 2. Ore Monogatari – continues to succeed in many ways. I hope you elaborate on that “execution” thought in a future post. I think I get where you’re coming from, but I don’t want to say anything until I’m sure. 3. Food Wars – my most pleasant surprise of the season has been just how sharply written and thoroughly entertaining this series is. Manga readers say the fanservice should start toning down around this point, and if that’s true, it could still give OM a battle for #2 before it’s over. 4. 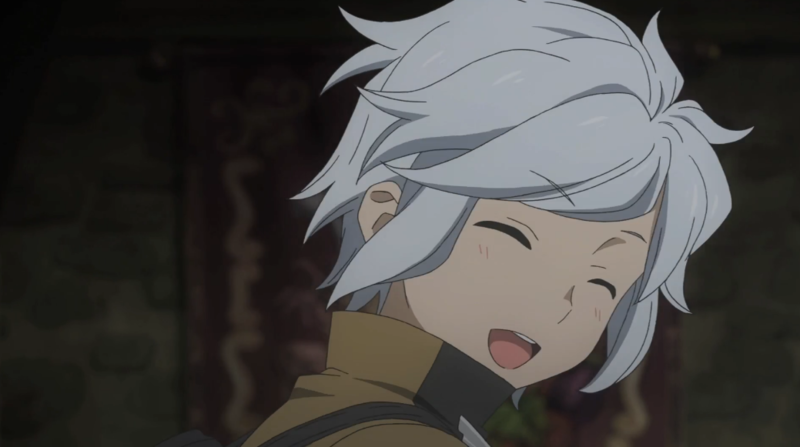 Danmachi – I’ve really enjoyed Danmachi, and part of that is exactly what you said: this is just a very pleasant group of characters to spend 30 minutes a week with. And moe toothbrushing is still my favorite opening of the season. I’ll look forward to your ep 6 post, if it gets written. 5. Kaitou Joker 2 – This is a series that’s upped its game. While I enjoyed the first season, the second season’s had more interesting adventures and even sharper writing. Last week’s episode mixed phantom thievery with spoofing idol anime, and it was hilarious. 6. Fate: Stay Night/Unlimited Blade Works – As an adaptation it’s competent, and visually it’s a feast, but apart from occasional exceptions like the end of ep 15, the whole thing just feels dead, like there’s no spark or soul to it. I’ve been struggling with that since midway through season 1, and I still can’t figure out where it’s going wrong or what would fix it. Still gets a 7, but that’s almost entirely coming from the strength of the original source material. 7. Houkago no Pleiades – Continues to be another pleasant surprise. HnP appeals to me as a sci-fi fan too, not just an anime fan – it’s teasing some potentially interesting concepts now that the plot’s finally opening up a bit more. This is also one of the two series this season (along with Euphonium) that I always put on headphones to watch, because the music is such a crucial part of the atmosphere of this show and my tinny laptop speakers can’t do it justice. 8. Otaku Husband 2 – Still perfectly enjoyable, but not as strong as season 1 IMO. 9. Yuki Nagato – I continue to treat this as an AU fanfiction, and I loved your analogy of a fanfic writer switching pairings halfway through their story. Haruhi might as well be the title character at this point, which doesn’t bother me since I like Haruhi, but overall I’m still enjoying this more as a nostalgia piece than because it’s actually a good series. Incomplete: Nanoha Vivid – now five episodes behind, as I (not so) patiently wait for the fansub group to catch up. If they take too much longer I might as well just wait to marathon it after the season, although they still haven’t announced if it’ll be one cour or two. If I picked up one more show it will be: BBB. It’s the one series that I [u]definitely[/u] would’ve picked up from week 1 if it hadn’t gone to Funimation, but hearing so many positive things about it – not just here but everywhere – and now seeing the Japanese pre-sales estimates rocketing upwards (currently estimating around 20K in sales for volume 1! ), I’m getting tempted to pick it up anyway, delaycasts be damned. Maybe in a couple more weeks if Vivid’s still in limbo…. Yup, I’ll be talking about my issues with Ore Mono in the upcoming posts for sure! And, as always, very glad to hear that Pleiades is still holding up well—I really do want to go back to it eventually; just need to find the time. And yes, Yuki-chan is far better as a nostalgia piece than an actual self-contained show. Please, Funimation, release the BDs sooooooonnnn (for the main series). Please watch BBB. Vivid’s subs are excellent and it really is as good as you’re hearing. I still haven’t watched all of the original series of Haruhi (mostly because I am SO CONFUSED about the episode order and partly because I suspect I have gotten to the Endless Eight of legend and I’m not sure if I want to do that to myself) but I really like what I’ve seen of it so far. But Nagato never was very interesting to me except in her capacity as a robot or AI or whatever she is. I don’t see any appeal to her character, personally, beyond that role and being the first one to come forward and start revealing the bigger picture. 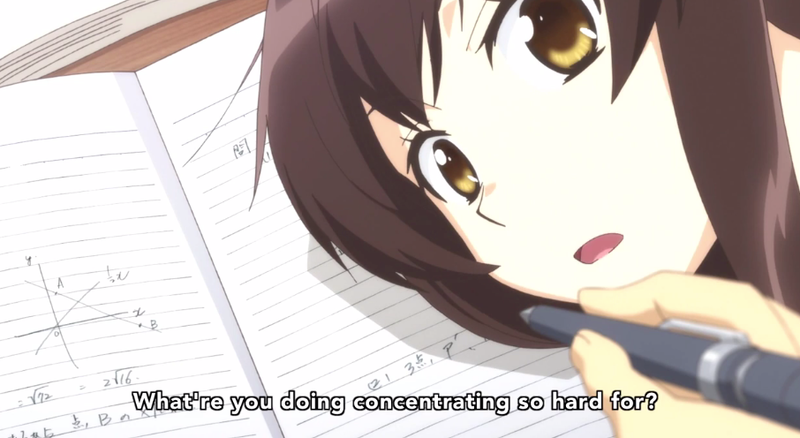 However, if the point of The Disappearance of Nagato Yuki is all an elaborate joke about how no one, not even the Main Character, can stand up to the force of Haruhi’s personality then I might have to go back and give it a second chance because that kind of meta narrative is totally my cup of tea. Haruhi’s order actually isn’t that difficult, unless you’re trying to re-create the original season 1 broadcast order – then you’ll be jumping all over the place. Season 1 can be watched either way (broadcast or chronological) and both are rewarding in different ways. If you’re watching both seasons together, though, then you definitely need to watch it chronologically (with one exception), because the second season episodes were never meant to be watched all on their own. If you take out the (S2) episodes, this is also the order in which Bandai arranged the S1 episodes on the US DVD release (AoMA first, and then everything else chronologically). If you’re not that interested in Endless Eight, the only ones that are essential viewing are the first one and the last one, but I still suggest trying to go as far as you can with it – it’s an important arc for Nagato’s character development, and really adds another layer to the Disappearance movie (which is an absolute must-watch if you enjoy the series). You can always skip straight to the last one if it gets to where you just can’t take any more. Thanks, that’s really helpful. I wanted to watch it in chronological order. I originally tried to watch it in broadcast order, when I first came upon the series and wasn’t familiar with it, and got confused really fast. I am going to try to persevere through the Endless Eight, though some people make it sound like torture. I love the concept of the series, it’s just some of the best dramatic irony I’ve heard of. I look forward to finishing it. I watched Haruhi in broadcast order myself and loved it that way, but if it was confusing to you that way—definitely go with chronological. I don’t think Yuki-chan is trying to be a meta joke, but I suppose it could become such the way things are going since Haruhi’s arrival. Well, here’s where I stand as of today. Yesterday actually, when this was posted and before the current eps of Euphonium and Ore Mono aired (though I haven’t watched either). Eden of Grisaia ep5; Backstory over, now we’re caught up the current day – and a massive bomb dropped at the cliffhanger. It’s a good thing I’m in the habit of fast forwarding through the credits and checking out the end (even though Grisaia has never had a post credit scene before) – otherwise I’d have missed the bomb. The girls have always been strong though uncertain and wavering, but now they’re strong, certain, and they have a goal. If you’re a redshirt wherever Yuuji is being held, I suspect now is the time to change careers or at least take your summer vacation. Otherwise, I hope you have a good benefits package – you’re going to need it. Midseason rating; None – what’s happened up to now has been decent enough, but it’s all been prequel to and setup for the main action of the cour. Ore Monogatari!! ep6/7; Waiting on your posts. Midseason rating; 3.5/5 Just above average despite high potential. It’s not really mid season as this is a two-cour show, and while it’s dang good so far it’s also been more than a bit off. Like WingKing, I’ll withhold my comments for your posts. Midseasons rating; Still enjoyable, though as WingKing says less focused and not as strong as the first season. Though, being a short, he gets less screen time than some shows secondary characters, Hajime takes home the Best Male Character award, closely edging out Takeo and Makato of Ore Mono who’ll split the second place pot. Midseason rating; 2/2.5 Below average and dropping. A train wreck I can’t take my eyes off of. My lady is still watching, and seemingly enjoying (or at least enjoying ranting at), but the moment she wavers I’ll hammer the drop button. Sound! 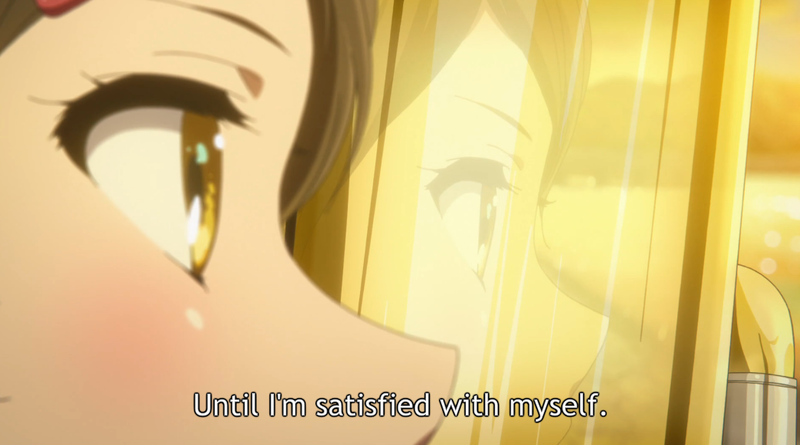 Euphonium ep6; Euph just keeps getting stronger and more delightful. Even this, in some ways the weakest episode to date, was well above average by any measure. Reading some reviews elsewhere on the ‘net, I think a lot of people are missing how subtle the writing and animation are and as a result are taking the show at face value. I pity them, as they’re really missing out… as with Ore Mono, Euph really is a different take on things. Midseason rating; A solid 3.5, well above average but likely not a classic (though that it not beyond the bounds of possibility.) As with last season’s Saekano (which I still maintain you should watch) this has turned into this season’s unexpected delight (edging out Ore Mono). Kumiko is far and away this seasons Best Girl, though in a rare split award – Yamato of Ore Mono is going to get the roses for Best Female Character. Overall, this has been a modest-to-weak season… And even though Grisaia is finally getting moving and Otaku Husband remains well done, if it weren’t for Euph and Ore Mono, it would be a total train wreck. In other news, my lady stayed home from our usual Tuesday social meeting (I considered it, but I had stuff I really needed to talk to people about and Randy was going to be there selling fresh eggs), and somehow decided to watch My Little Monster. It’s been on the periphery of my radar for some time, so she’s going to hold off until I get caught up to her. Man, it’s really a bummer PlaMemo has tanked the way it has. I think its sales are pretty much dead, too, so RIP Dogakobo’s first original project…trying sticking to what you’re good at next time, guys? And yup, Eupho is truly fantastic—I’ve also seen some of those review (or just comments) from people who seem to be glossing over the subtlety, which is a bummer. It’s a great show and I’d be really pleased if more people were able to see it the same way I do (but that goes from pretty much everything haha). I think, in the end, I’ll consider this a pretty strong season once I get to Oregairu and back to Pleiades. I’m really missing out on what seem to be one of the season’s best and a genuinely fun show with those two, and added to BBB and Eupho and lighter stuff I’m loving like Danmachi and Kinmoza, this season is pretty much checking all the boxes for me. BBB is the show I wait for. A friend is considering dropping because of what he called a FLCL vibe (I think it’s the motor scooter). I rarely get such a sense of a layered world in an anime. Look forward to it every week. And I am officially smitten by “Show By Rock” , Shingan Crimsonz clinched it for me! Such is my admiration for a man with a full-time job! Rom, a man with a full-time job. Truly a role model for us all.